Peacock Sheridan Group has thrown down the gauntlet once again. 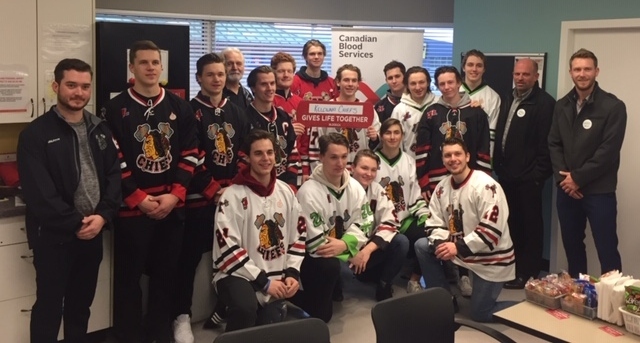 For the second year in a row, the financial planning company is challenging other Kelowna businesses to take one day in February and donate blood to support patients in need. Peacock Sheridan partner Grant Sheridan is also the GM of the Kelowna Chiefs junior B hockey team, so he had members of his squad on hand for Thursday’s launch event at the Canadian Blood Services donor centre on Dilworth Drive. Also in attendance were former hockey referee and Canadian Blood Services volunteer Brett Shaigec and his girlfriend Jordan Korol, a UBCO Heat women’s basketball forward. Korol beat acute lymphoblastic leukemia when she was three years old, needing blood transfusions along the way.